Wisdom teeth removal is a surgical procedure some people, unfortunately, have to undergo because they get impacted, inflamed, infected, or for other reasons. Some people need only one wisdom teeth extracted, others may need to remove more or even all of them. This surgical procedure can be done with local or total anesthesia, depending on various factors, but if only one tooth needs to be removed, it is usually done with local anesthetic. It can be done by a specialized surgeon or a dentist. In most cases it is an outpatient procedure. After the surgeon makes an incision in the gums, removes the bone above the teeth (if there is any) and pulls the teeth out, the incision is closed with stitches or sutures, which are usually removed after a week or so. In some cases they dissolve by themselves. The recovery period varies from person to person, ranging from only a few days to few weeks. During this period, some pain, swelling and bleeding is to be expected. However, in some cases, approximately one on every 20 patients, mild or serious complications may occur. Because the upper wisdom teeth are close to the maxillary sinus, it is possible that bacteria from the tooth reach it and cause an infection. This complication may need a surgical treatment to drain the sinus. Also, it is possible that a fragment of the tooth penetrates the sinus. If it cannot be removed with saline irrigation, it requires a procedure called Caldwell Luc. Between one and eight out of 100 people may have temporary or permanent nerve damage around their mouth after wisdom teeth removal. This means that lip, tongue or chin may be tingly or numb. In one of 100 cases the numbness is irreversible. Trigeminal neuralgia is an extremely painful condition that can occur in case there is a damage to the trigeminal nerve. It affects eyes, lips, nose, scalp, forehead and jaw. 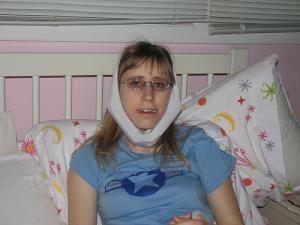 It is a very rare complication of wisdom teeth extraction. After the tooth is extracted, a blood clot forms at its site. If the clot is dislodged, the tooth socket may become inflamed, causing sharp pain. This complication can resolve itself in a few weeks. If the procedure involves removing some of the jaw bone in order to remove an impacted tooth, it is possible that the bone gets weakened and fractures. Infection may occur in one or two out of 100 people who had their wisdom tooth removed. The symptoms include fever, pain, swelling, bad or salty taste in mouth. Air embolism is one of the more severe complications of this procedure. A bubble of air may pass through the jaw bone to the veins and to the heart and it may cause cardiac arrest and death. It happens if a mixture of air and water is accidentally injected. Anesthetic can cause anaphylaxis in people who are allergic to it so it is important to inform the surgeon in case there were previous allergic reactions. Other complications may include injury to teeth, heavy bleeding, hematoma, dizziness, root fragments, headache, and TMJ pain.